Folkdancers' Association of Nova Scotia (FANS) is a group of people who enjoy traditional dances from around the world. They provide opportunities for the promotion of that enjoyment in our community of Halifax, Nova Scotia. We (FANS) have a "feet on" approach! We offer the following variety of International Folkdancing experiences in metro. Check out our video! A relaxed, recreational setting is maintained, while we primarily do folk dances from South-Eastern Europe and the Near East (including Albania, Bulgaria, Greece, Israel, Macedonia, Romania and Turkey). The level of difficulty usually progresses through the evening, with teaching and review near the beginning. Later on, dances are chosen from the participants' requests. From 7:30pm to 8pm, there will be dance instruction and review. 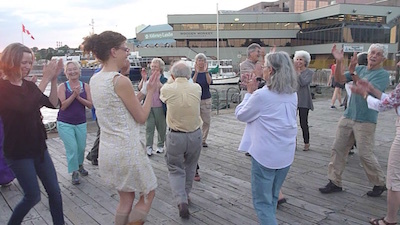 In the summer we dance on the dock beside the Ferry Terminal in Dartmouth, weather permitting.